Apple's is dramatically revamping its audio hardware in 2019 with high-end AirPods, over-the-ear headphones and a new HomePod speaker, according to a new report today. 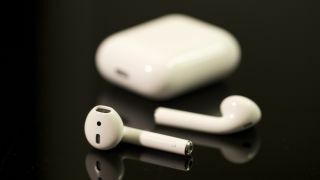 The AirPods (2019) are said to upgrade the wireless earbuds with noise-cancellation, water resistance, and a longer wireless range, reports Bloomberg. Its water resistant is meant to combat rain and perspiration, not become suitable for swimming. Apple is also said to be internally thinking about adding biometric sensors for new AirPods, including a heart-rate monitor. This seems less certain in the report's language, though it has become a standout feature of the Apple Watch. Plot twist: all of this may technically be saved for the AirPods 3, not the AirPods 2. We've been anticipating a new AirPods wireless charging case to work with the delayed AirPower charging mat due later this year. AirPods 2 may still be coming with features like a new chip (likely W2) and support for hands-free Siri activation, notes today's report. Apple may finally be ready to unveil over-ear headphones to rival Bose, Sennheiser and other top companies that fill out best over-the-ear headphones guide. New headphones and a HomePod, too? It's said to be marketed as Apple's higher-end alternative to its Beats headphones, complete with native Apple branding. The over-ear cans were intended for the end of 2018, but faced development delays. A new release date is set for early 2019. Early next year is also when you might see a new HomePod. There were no details about the HomePod 2 attached to today's report, but we have previously heard that Apple may be working on a Beats-branded HomePod or at least something cheaper than the current pricey HomePod smart speaker. There's a lot of time between now and early 2019, when Apple's audio hardware revamp is expected to get underway. Expect to see more reliable Apple leaks between now and then.